Huh? Another? 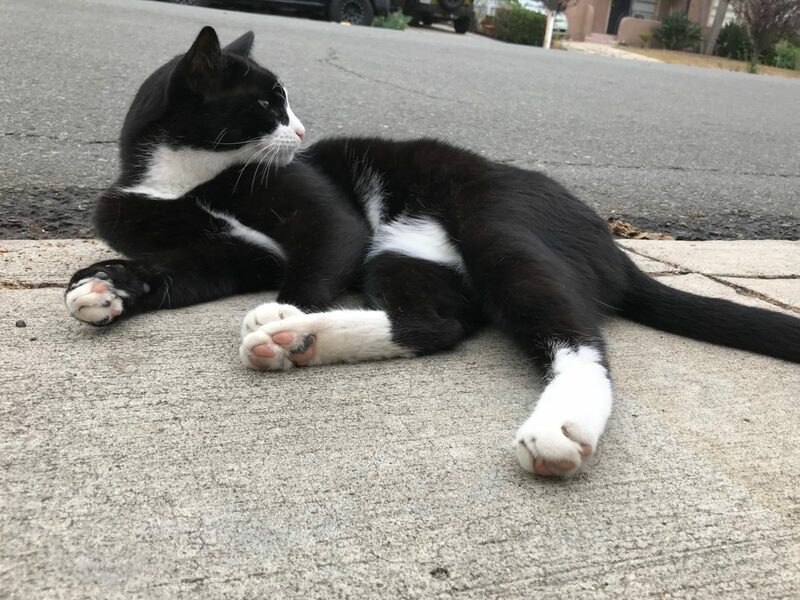 Today’s putty-tat—photographed at 9:26 this morning (PDT)—is the eighth tuxedo to appear since the series started in October 2016. 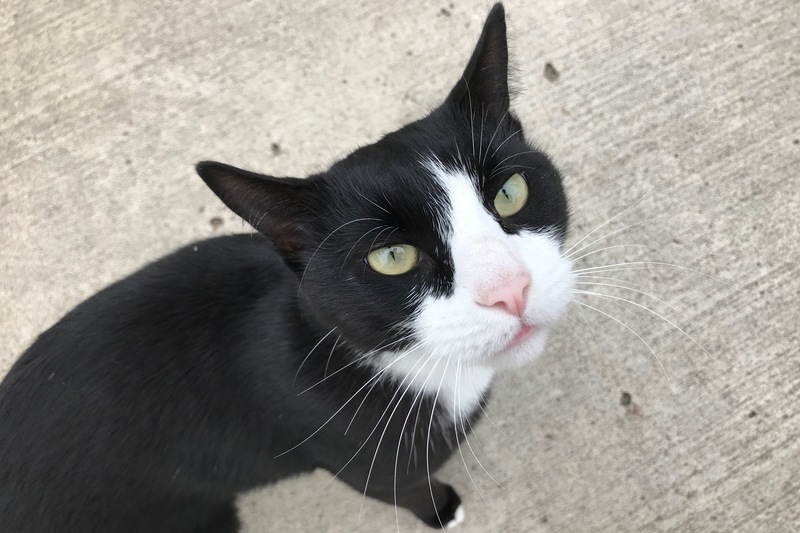 The friendly feline sprinted onto the sidewalk from a yard along Monroe Ave. near Louisiana. Somebody wanted pats and got plenty of them, making one-handed portrait-taking rather awkward. The Featured Image is first capture, from an accidental burst grouping. Reflected in the eyes, you can see me looking down, holding iPhone 7 Plus. Vitals: f/1.8, ISO 20, 1/331 sec, 3.99mm. The furball had no collar, or other identification, so I give nickname taken from T.S. Eliot poem “The Song of Jellicles“, which is an ode to the tuxedo from his tome Old Possum’s Book of Practical Cats. I was feeling blue on a grey day, but Jellicle brightened my mood. Anne and I have been trying to buy a house, with prospects looking less likely following yesterday’s property inspection. Yeah, the kitty was the remedy needed for my emotional ills. The other seven tuxedos (also repeated in the master archive below): Fraidy, Patience, Pepe, Poser, Sammy, Spot, and Tux. Oh, and vitals for the other two pics are same as the first, except for 1/460 sec and 1/406 sec shutter speeds, respectively. 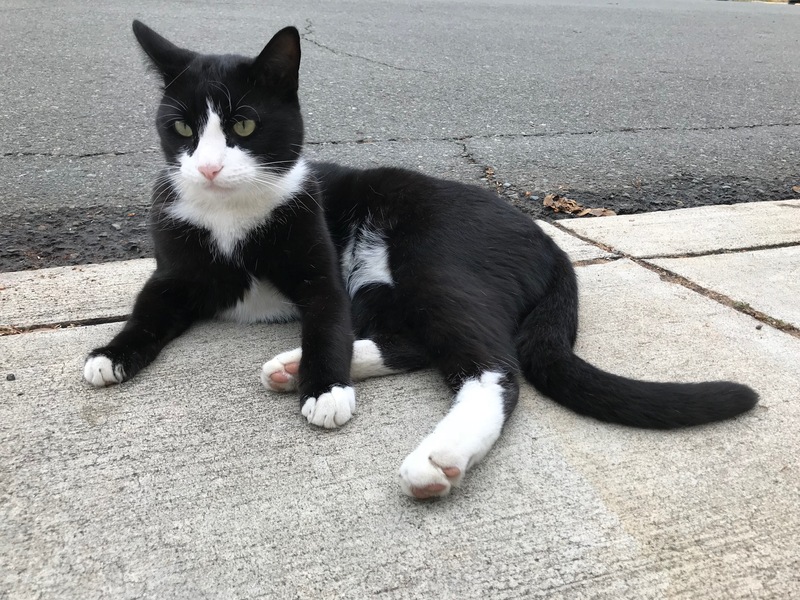 Previously featured felines: Scruffy, Roly Poly, Woo, Skull, Biscuit, The Colonel, White, Chipper, Frisky, Stretch, Needy, Farfisa, Mates, Hunter, Pee-Pee, Blue, Blue Too, Bonded Pair, Patience, Fess, Jumper, Frenemy, Looker, Cozy, Scout, Lurks, Skit, Mini, Betty, Black and White, Stalker, Bell, Chill, Sammy, Scratch, Poser, Star, Grey and White, Watcher, Herman, Comet, Roman, Willow, Chub, Nimbus, Watson, Lilo, Kit, Pepe, Twilight, Sebastian, Spot, Booger, Ash, Veruca, Riley, Mellow, Bonde, Flower, Glass, Black, BeBe, Fang, Bruce, Siamese, Pounce, Tortie, Haiku, Fraidy, Peso, Daniel Tiger, Dusk, Stride, Dainty, Spry, Tabby, Betty Too, Still, Levi, Shadow, Sophie, Wink, Ferals, Momma, Charlie, Tux, Cool, and Benny.